Except The Union forgot to post this on the front door. Duh! Thank you for this info.This outreach is so important. Our son and DIL ( 7 mos pregnant!) live in Yuba City. They are on their way here now. Will be so glad to see them. I read your comments on Facebook. Our family wishes you and your family all the best. And thanks for all you have done for our public schools! Hi Jeff: Here is information on Oroville Dam. This evening’s article in the Sacramento Bee (http://www.sacbee.com/news/state/california/water-and-drought/article132332499.html) contains 2 dam inundation maps that depict the geographic area that could potentially be affected. 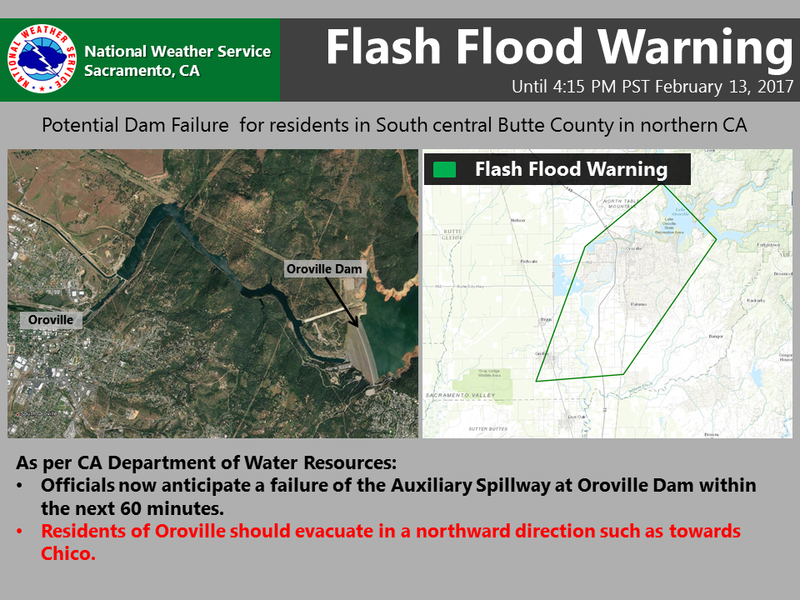 There is a total population of 27,574 in the POTENTIAL Oroville Dam inundation zone within Butte County. Within the POTENTIAL inundation zone there are several essential service facilities such as a wastewater treatment plant, several helipads, a few fire stations, and 355 bridges. Natural gas pipelines and other energy related plants are not mentioned in relation to the potential inundation zone. I’m keeping folks from Oroville, Yuba City, Marysville in my prayers tonight. Safe travels. Hope you and family are all OK! Thanks George. We are about 60 miles Southeast of this. Thoughts and prayers go out to these people. I went to the fairgrounds to deliver food and the look of despair on some faces was heart wrenching. The Union still has not updated their “real time feed,” showing just 400. That’s out of date and wrong! I am not normally a Union basher, but this one takes the cake. We’re getting quicker and more in-depth coverage of the nation’s largest potential disaster happening in our back yard out of LA and New York than our local “news” paper. The Daily Mail out of UK has FAR better coverage than the Union. The Union can’t even keep up with public broadcasts by the agencies. Kudos to YubaNet!! I forgot to add, kudos to KCRA! Awesome coverage. They’re doing an incredible job covering this. Jeff, can you please share what local relief efforts are being organized for our visitors camping at the fairgrounds and filling our hotels? To what local agencies might our help be directed? Placer County Fairgrounds is providing shelter to evacuees from the Oroville Dam Emergency Spillway Incident. Please park in Parking Lot C, enter Gate C, and check in at the Garden Room. Perhaps the best thing to do is donate gift cards from budget retail and food stores to the evacuation centers, since they are right there tracking the needs of the guests.